Bill Jacobs BMW of Naperville is proud to announce that their dealership, for the 2nd month in a row, received BMW’s highest customer sales satisfaction score in Chicagoland. In the months of May and June, Bill Jacobs BMW earned a 99.8% customer sales satisfaction score with 5 stars. We take pride in offering our clients first class service and bringing them happiness in their selection of a new or pre-owned BMW from Bill Jacobs. [Bill Jacobs BMW of Naperville is proud to announce that their dealership, for the 2nd month in a row, received BMW’s highest customer sales satisfaction score in Chicagoland. In the months of May and June, Bill Jacobs BMW earned a 99.8% customer sales satisfaction score with 5 stars. “We take pride in offering our clients first class service and bringing them happiness in their selection of a new or pre-owned BMW from Bill Jacobs,” said Rick Ayash, General Sales Manager at Bill Jacobs BMW. Bill Jacobs BMW is always working on improving the customer experience at their Naperville dealership, and enjoys finding new ways to provide customer service that goes above and beyond. These latest scores show that Bill Jacobs BMW is consistent in making customer service a top priority at their Naperville facility. “I’m very proud of our sales team and appreciate our customers’ acknowledgement of their striving for 100% customer satisfaction,” continued Ayash. The Sales Customer Satisfaction Score data comes from BMW North America’s monthly CSI Sales Report, which compiles the responses and data submitted by customer surveys. These surveys are sent out via email by BMW North America after a customer takes delivery of their new or pre-owned BMW from Bill Jacobs. The survey questions are geared at getting a complete picture of each customer’s individualized experience with Bill Jacobs BMW, and also their overall satisfaction with their recent purchase. Customers are asked to rate the dealership and employees they met on metrics like courtesy, honesty, integrity, product knowledge, explaining paperwork, delivering value, and competitive pricing. Bill Jacobs BMW customers are also asked if they would recommend the dealership to a family member or close friend for their future automotive needs. 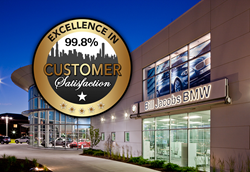 Bill Jacobs BMW thanks their customers for great reviews, and welcomes the entire Chicagoland area to stop by and see how their superior customer service sets them apart from the competition.